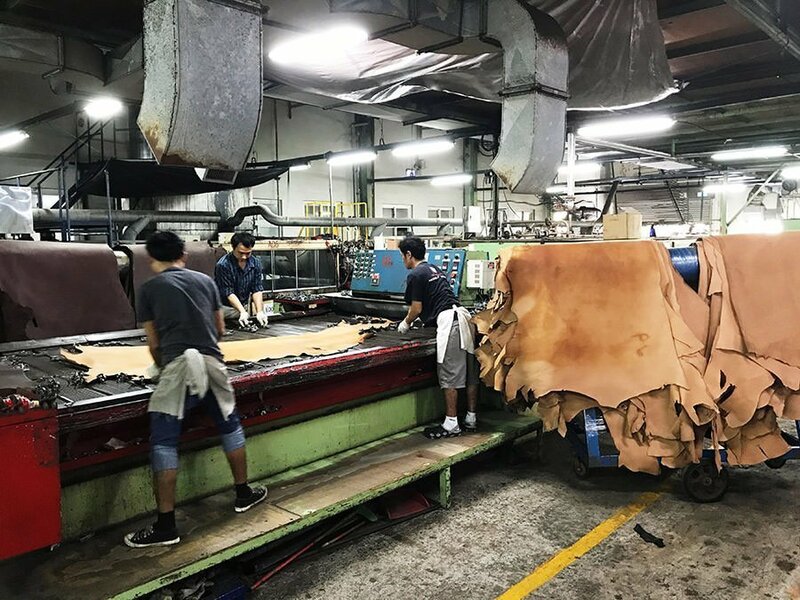 Leather tanning is the process to transform the skins obtained from an animal to long lasting materials that can be used for many different types of products. Leather tanning has hundreds of years of history. In this passage, we would like to make a brief introduction to this old, yet still developing craft. 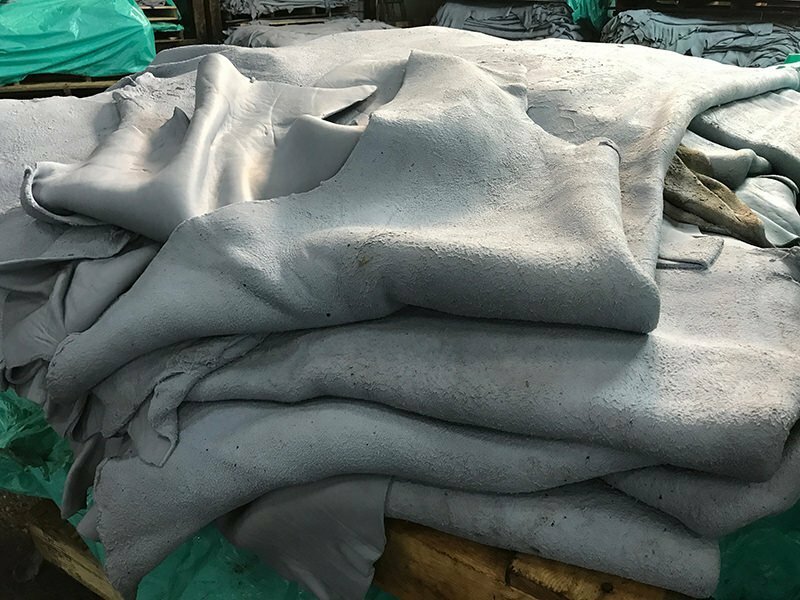 Leather tanning has undergone a lot of changes and development, yet even in the industrialized modern time, the whole tanning process still requires list of complicated stages and procedures. Leather quality can be affected even though just a tiny variation has occurred during the tanning process. Now, let’s embark on the journey of how Alto leathers were tanned and manufactured! 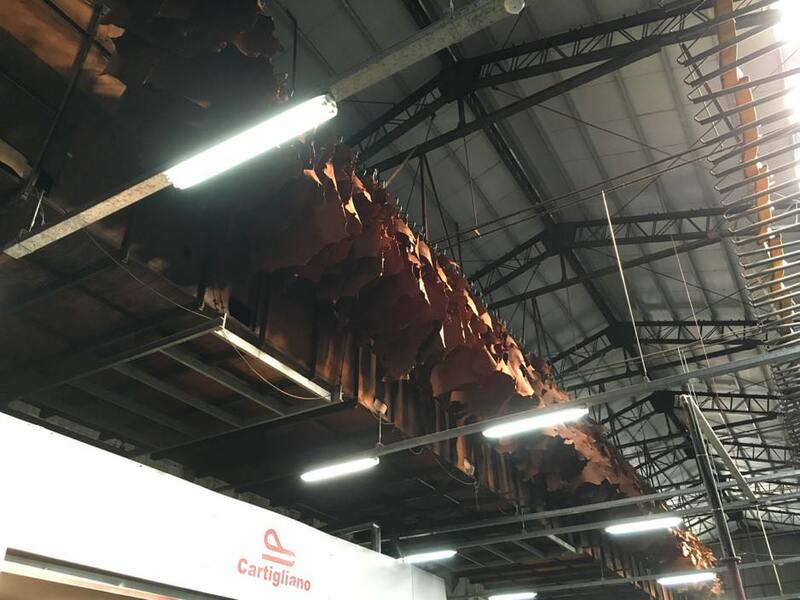 Our big thanks go to Tehchang Leather Products Co., Ltd in Taiwan who share the information about their visit to Alto’s leather manufacturer, which is far away in Italy. 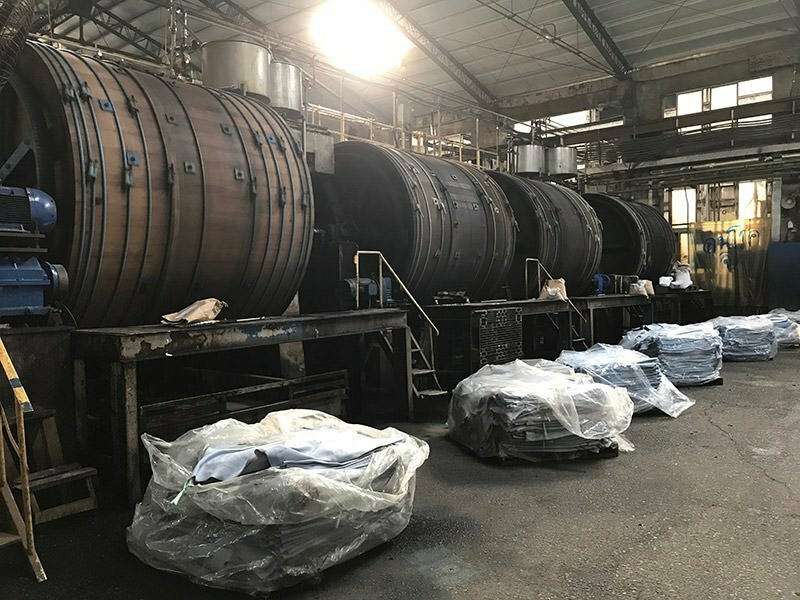 The first thing that had caught our eyes when we visited the factory was those large drums (similar to washing machine drums). Drums are used to soak the preserved skins that hairs, debris, blood and excess animal fats are still attached on. Animal skins will soak in water for four days by adding chemicals such as disinfectant, lime, chromium salts and enzyme. Liming is used to unhair and remove debris from back of the skins. 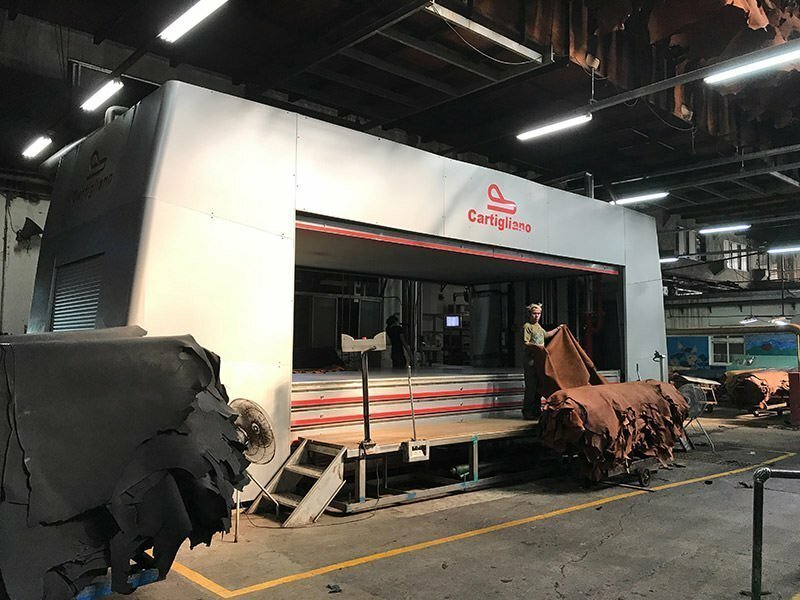 This procedure also helps to prepare them for chrome tanning process at the later stage. Chromium salts are light-blue in color. Therefore, the soaked skins were called “Wet blue” after they have been chrome tanned. Instead of chrome tanning, animal skins can also be tanned by vegetable tannins which is called vegetable tanning. These two types of tanning process result in different leather textures. Chrome tanned leathers have wider and richer varieties and textures which make them better for leather products in general. This also explains why chrome tanning is more popular in the market. Every crust shall first go through splitting. This process separates the Wet blue into full-grain and bottom grain leathers. At this stage, the width of the leather will also be decided. 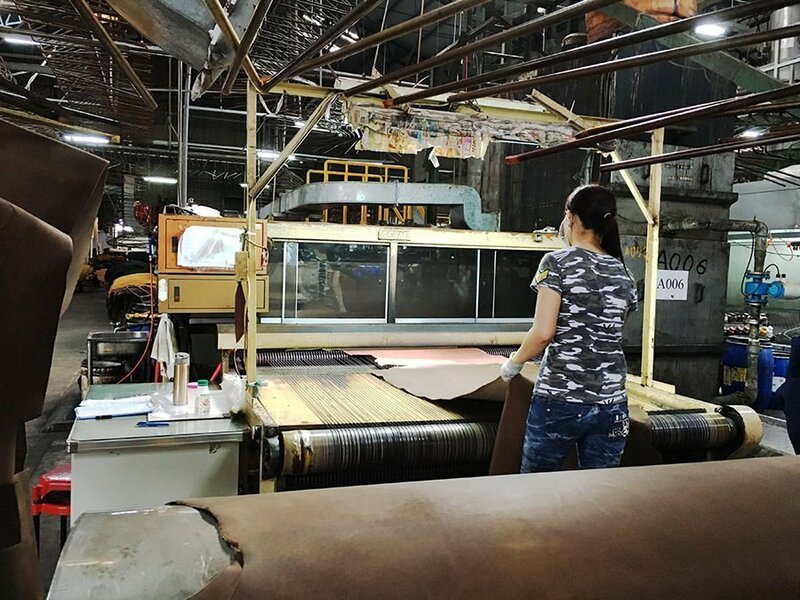 Full-grain and inner bottom grain leathers are separated by splitting machine. The top layer is the full grain leather, which is more durable and has higher value. Its preserves the natural texture and hair pores and is suitable for manufacturing high-end leather products, while the inner bottom grain is the flesh split, also called split leather, which is usually used to produce cheaper leather goods. After the splitting process, the crusts will once again put into drums for tanning. 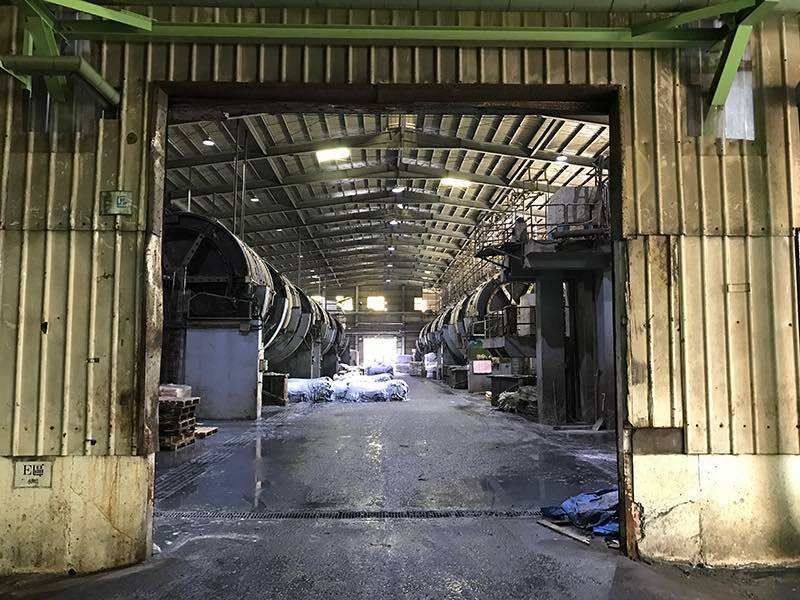 Additional tanning and dyeing agents are added to impart properties and change the features of leather, as well as giving the first dye to the crust. Medium-sized drum and large-sized drum can be used for tanning approximately 3,000 feet and over 5,000 feet of leather each time. That’s why a minimum order system is common among the industry and why ordering leather is not as easy as one might think. 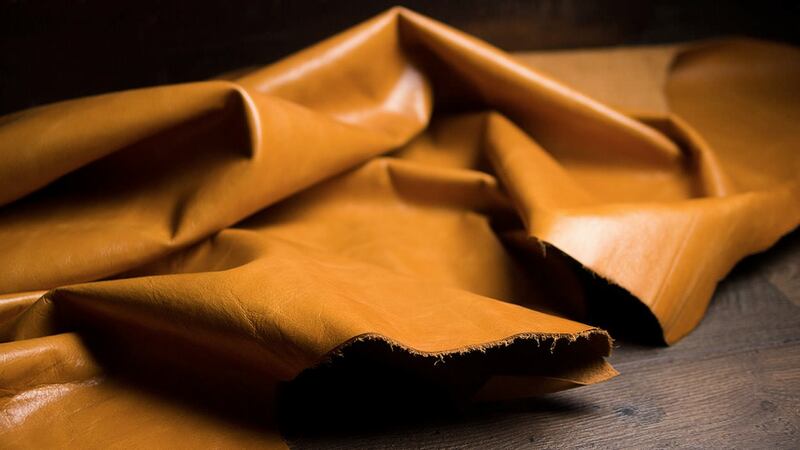 Although tanned leather is ready for use, it still requires several processes, such as stretching, vacuuming, drying and frame drying before further processes can be applied to achieve the desired texture. Firstly, the leather will be put into a low heat vacuum dryer (like ironing) to obtain a flat and smooth surface. Then, the leather will hang to dry, or put into a big drying machine for quick dry. 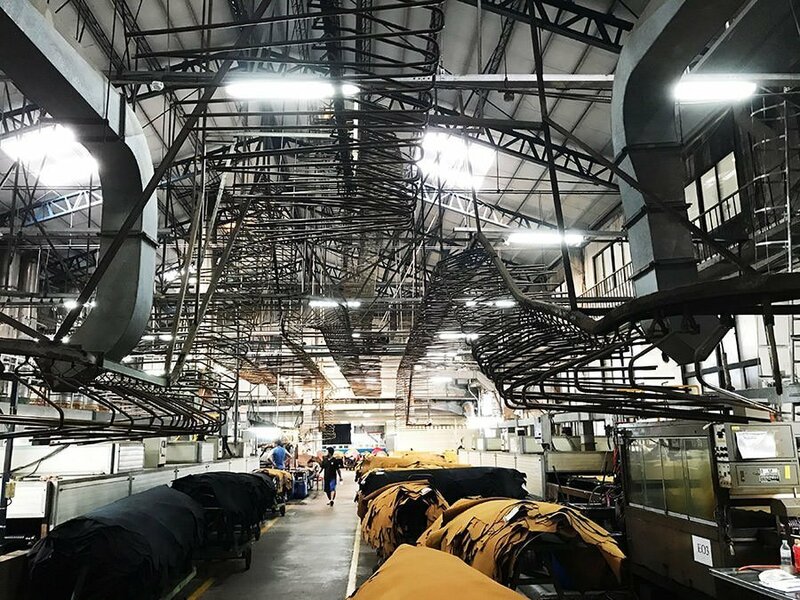 In peak seasons, leathers are hung to dry with tracks on the ceiling that create a fantastic view in the factory. After ironing, leather material shall undergo frame drying to avoid shrinking from its original size. Tumbling is a requested process depending on the customers’ requirements. By putting the leather into a rotating small drum, it can create more evident grain, softer texture and natural markings on the leather. The natural markings and finishing on Alto’s aniline leather were made by this method. The longer the tumbling, the finer the markings can be produced. The markings on the leather may appear like the skin of a lychee, therefore, it is also called “lychee marks” or “lychee leather” in Chinese. Although “lychee marks” can also be made by ironing, tumbling process can usually achieve more natural outcomes. Next, the leather will proceed for finishing. Even though dye agents were used during tanning, nearly all leather needs additional coloring chemicals by leather spray machine or by hand in order to achieve the desired color. This process is important for the final look of the leather. Aniline dye helps to keep the natural touch on the leather. This is also the reason why Alto uses aniline leathers. However, natural markings such as scratches and bug bites can be easily seen in aniline leathers. Therefore, selection of high quality leather is the key, yet this may lead to higher cost. Some genuine leathers appear to have more even color and markings on the surface as thicker layers of chemical coloring were applied. The chemical colorings covered all the grains and textures but also covered all the defects and scratches on the leather, which that can indirectly increase the usable area of the leather and yield higher economic values. Using women’s makeup as an analogy to explain the effects – Aniline leathers are women putting on light makeups, the extra layers of dye are the concealers on women’s face that are used to cover the defects on their skin. The choice of different leather types depends very much on the style and design of final products. Alto uses aniline leathers for their products as they look more natural. The aging effect on the leather over a long period of time explains why the color of Alto leather changes from time to time. The art of leather tanning and manufacturing involves professional knowledge and excellent skills from experienced craftsmen. 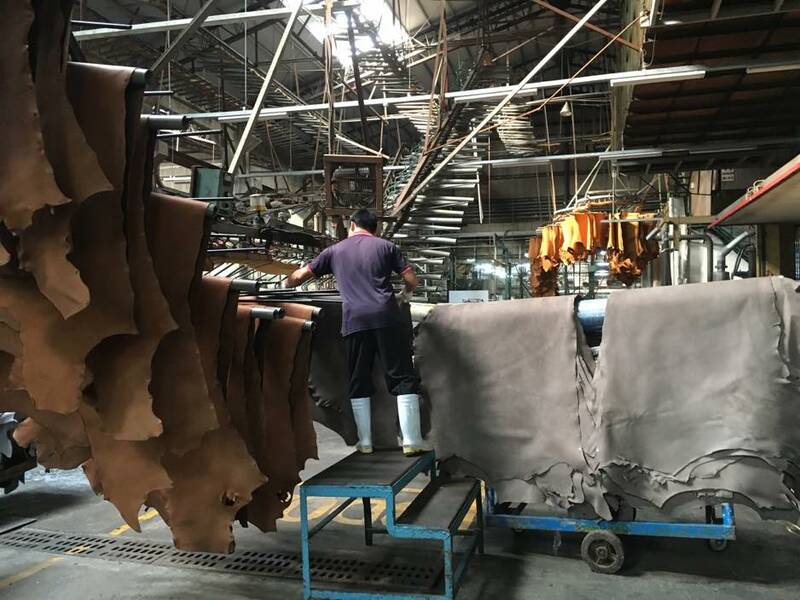 Depending on the requirements of the leather products, there are still many more processes and methods, such as color dye roller coating, fatliquoring and nubuck among others to create different unique leathers. Apart from that, quality checking and grading of leather itself is also one among many related expertise that requires continuing research and study. 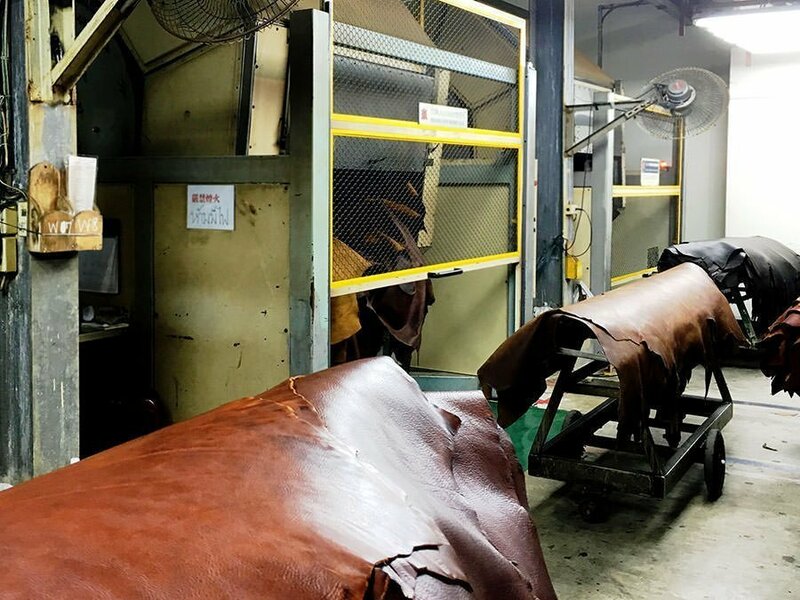 We hope this short passage can briefly introduce how Alto’s leather is manufactured. We treasure every precious material we get from nature and are working with all our efforts to reveal the true beauty of each leather product.